Cast of characters: Alan Ritter and Nathan Ritter (7-1/2), from St. Louis, MO; Jake Krawczyk from Solvang, CA (he had the good sense not to come along for the whole trip); John Fraser, Lindy Fraser, Andy Fraser (13), and David Fraser (9), from Seattle, WA; Lori McConnell, Jesse Kingsley (13), and a German exchange student, Martin Jabs (17), also from Seattle. This would be the fourth trip to Mt. Ritter for John and me, and the second for the rest of the group, except for the newcomer, Martin. As apparent from the list of participants, I have a certain personal/familial interest in Mt. Ritter, although I have yet to find a direct link to Karl Ritter, after whom Whitney named "our" mountain. Nathan and I departed St. Louis via TWA. The flight was late because of incoming flight delays, nearly an hour so at takeoff. Smooth flight...usual bumps over the Rockies, but nothing worth noting. Arrived Reno without incident, collected baggage and took the shuttle to the Best Western Airport Plaza. Picked up Alamo rental car. (Two points for Best Western van driver...he took us directly to Alamo, which is off the airport proper, rather than making us go to the airport and then catching Alamo shuttle.) Took state roads up to and past Lake Tahoe. Admired views, took a few photos. Then on down to Bodie and spent about an hour wandering around the ghost town. Bodie is definitely worth a whole day sometime... lots of good photo ops. We arrived at Mammoth Lakes about 5:35 p.m., found a note from Jake...had missed him by about 5 minutes, so we unloaded the car, and he arrived a second time just about 6 p.m., at the other end of our appointed meeting time. Had dinner, talked over plans for Sunday with Jake, packed day pack for warmup hike the next day, crashed. Nathan and I arose bright and early to beat the 7:30 closing of the Minaret Summit road (shuttle buses only after then), Jake stopped by, and we hit Agnew Meadows by about 7:15. 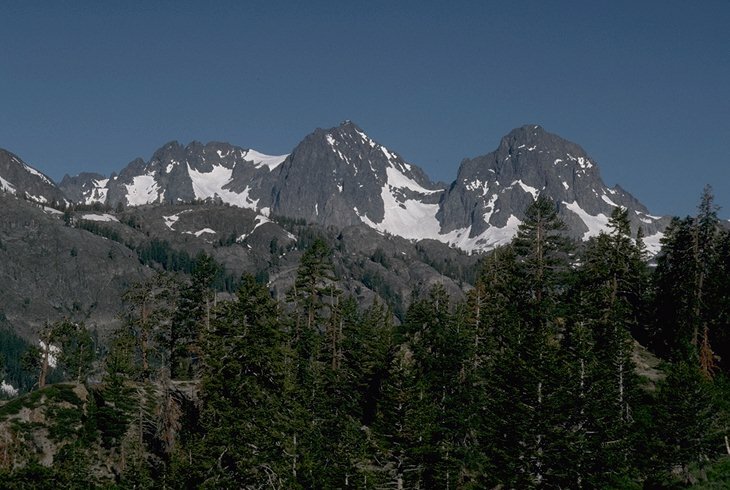 On a typically beautiful sunny Sierra early-summer day, we hiked a couple of miles up the Pacific Crest Trail, stopping several times to survey Ritter and Banner across the way. There was a lot of snow up there this year, after a heavy snow winter, plus we were a couple of weeks earlier in the season than the last time we had been around. We hiked the High Trail as far as Two Teats, and decided it was time to get Jake back so he could drive back to the L.A. area before dark. We started getting things organized for the trek to Thousand Island Lake and beyond. John, Lindy and the boys arrived about five p.m., and we did a little organizing before grabbing dinner at an Italian spot across the road. Lori, Jesse, and Martin arrived about 8:30, after we had things pretty well under control for the stuff the earlier crowd had brought in. John and I ended up with about 55 pounds each, at least 5 less than the last time. Nathan got his requisite 15 pounds (25% body weight), and we didn't have to leave anything critical behind after passing our light tent off for Martin to haul. Once again, time to crash for a very early start again in the morning to beat the road closing. Tomorrow the trip starts for real! We managed to get everyone up early and over the Minaret Summit road, down to Agnew Meadows. 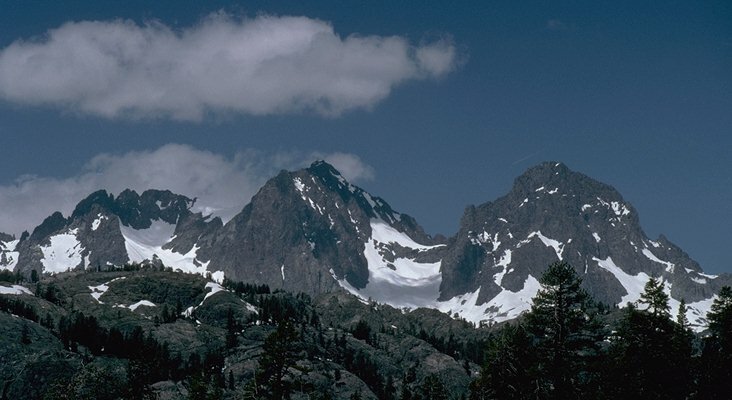 The trip started off fine with great views from the Pacific Crest Trail over the valley to the Ritter Range, Shadow Lake, and the falls on Shadow Creek down from Shadow Lake to the San Joaquin River. Shadow Creek looked particularly active with snow melt from the winter's bumper crop. As we walked, we watched the ceiling close in first on Mt. Ritter, then Banner Peak, and steadily move down to the 12,000' level. Still, we pressed on toward our stated goal for the day of Thousand Island Lake. As we approached Badger Lakes, it began to snow (SNOW???) intermittently, and the wind came up. As the younger kids were pretty well tuckered out, we selected a sheltered campsite near one of the small ponds in the Badger Lakes group. Dinner was prepared and consumed, and we settled down for the night, assuming that the storm would blow over and we would be able to proceed as planned on Tuesday. Far from dying down, the winds picked up overnight, as evidenced by the singing pines and the low roar coming down the valley from Thousand Island Lake. 180 degrees out of phase from Christmas, and it's snowing in the Sierra? Well, that was definitely the case. Amid flurries and snow showers, we made breakfast and started figuring out our alternatives. Clearly, we were not going to move camp with the kids to a higher, much-less-protected location by Thousand Island Lake. In addition, John and I were becoming concerned about the possibilities of continuing over North Glacier Pass and on down to Lake Catherine and the Ritter Lakes. After lunch, John and I decided to head up to Thousand Island Lake, reconnoiter the route over the pass, and cache some food for an attempt to stay true to plan, if one day late. Lori came along with us, and the three of us reached Thousand Island Lake in good order. As expected, the snow was heavier up there, and the wind much stronger than at our sheltered campsite. We had obviously chosen well when selecting a site, as the winds were extremely strong, and there is little natural shelter around the lake. 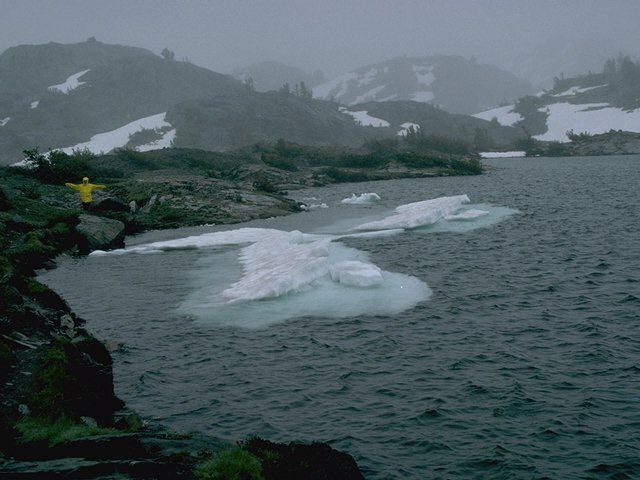 In addition, the heavy over-winter snows had only recently melted out around the lake shore, and there was virtually no dry ground handy for a camp. The trail was alternately under water and under snow. We did spot a couple of isolated bear tracks in the mud, but did not see the critters themselves. 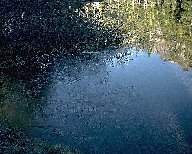 Upon reaching the far end of the lake, we found a convenient clump of trees in which to cache the food and said a silent prayer that Brother Bear had better sense than we did, and would stay inside his den. We then beat a retreat back to our campsite at Badger Lakes, fixed dinner, and settled down for the night. The morning dawned a bit brighter, with the clouds lifting and presenting an Ansel-Adams-esque view of Ritter and Banner from our bear-bag spot on a cliff above the steep talus slope next to our campsite. However, the wind was still blowing fairly strongly, so, discretion being the better part of valor, Lori and Lindy decided that they should take the kids back to civilization instead of being stuck in a snowstorm at 9,500' for a couple more days. We broke camp, and Lori, Lindy, Martin, Jesse, Andy, David, and Nathan headed back down toward Agnew Meadows. Meanwhile, John and I headed up toward Thousand Island Lake and North Glacier Pass. Even with a late start, the morning started off well enough, but the clouds and snow returned all too quickly. John and I located our cached food (Brother Bear definitely did have better sense than we!) and used the shelter of the clump of wind-blown pines (a real John Muir campsite!) to eat our lunch. As we walked up the snowfields from Thousand Island Lake over the low ridge and into the valley leading up to North Glacier Pass, the snow became ever heavier and the winds stronger. By the time we had reached the one-third mark up to the pass, we were in a veritable blizzard of popcorn snow driven into our faces by a 40-mile-per-hour wind screaming down the pass. The still air temperature was down in the 20's, and the wind chill certainly well below zero. Not exactly what we had assumed for conditions on June 26! With visibility rapidly falling to 100 feet or less, we decided it was foolhardy to try to make it over the pass and down past Lake Catherine and on to Ritter Lakes. We turned around and headed back to Badger Lakes. There had already been at least six to eight inches of new snow at the 10,500' altitude we reached, with the promise of much more higher than that. It was snowing so hard that by the time we dropped back a mere 200' or so, we could no longer see our tracks, and had to make our way based on the few landmarks we could see in the driving snow. The hike back past Thousand Island Lake proved only marginally more pleasant with the wind at our backs, as the clouds rapidly descended to the 10,000' level of the lake and visibility dropped to a hundred yards or so even when the snow relented for a few minutes. We set up our minimal camp in moderate snow, made a quick freeze-dried dinner, hung the bear bag alongside one we had left at the campsite with food for the planned return, and hit the sack by about 7:30 p.m. The snow tapered off during the night, and the sky began to clear, as evidenced by dappled moonlight shining on the tent about 11:00 p.m. When John and I awoke about 6:30 a.m., camp was frozen solid. The temperature had dropped substantially overnight, and the remnants of the previous day's snow, along with a heavy frost, coated the campsite. Despite the morning's clear skies and abundant sunshine, we were convinced we had made the best decision in backing down the previous day. 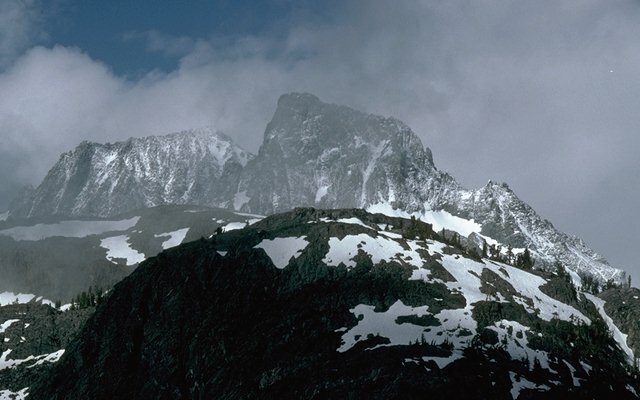 My summer (mosquito-net roof) tent would have been inadequate shelter in the sort of driving snowstorm we would have walked into on the windward side of the Ritter Range. We managed to get things halfway dried out and packed to hit the trail by about 8:30. As we trudged back down to Agnew Meadows, Mt. 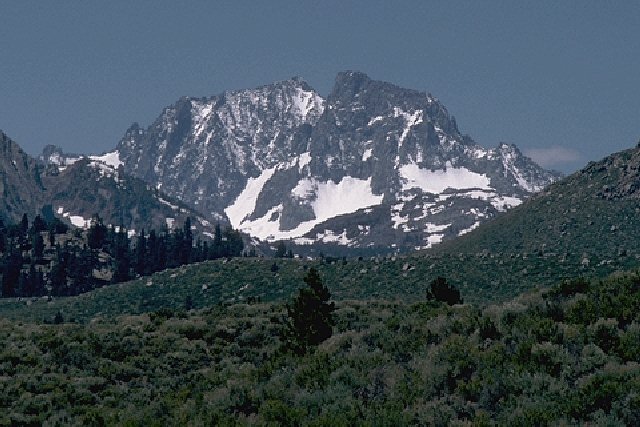 Ritter and Banner Peak, in their fresh covering of snow, mocked us from across the valley. Unfortunately, we were just one or two days too early, but the realities of jobs, vacation schedules, and families prevented us from extending the trip beyond the one slack day we had built into the schedule (and used sitting in camp on Tuesday). Certainly to try to hike over North Glacier Pass Thursday, climb Ritter on Friday, (assuming the weather would hold) and make it back to Badger Lakes the same day (a very long day, at best), then walk out according to our original plan on Saturday would have stretched us to the limit and left no margin for error. 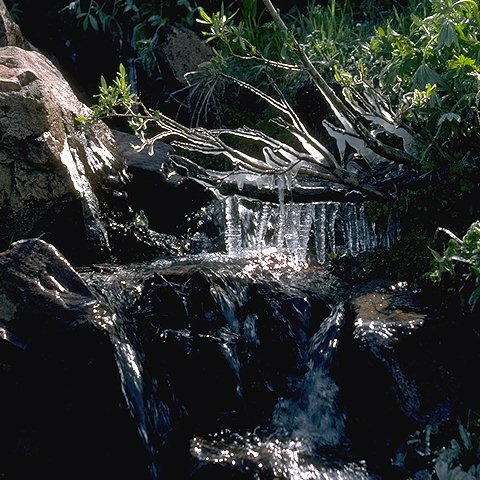 The hike back was chilly but clear, with a forest of icicles hanging from foliage and twigs over each little creek splashing down from the ridge between June Mountain and Mammoth Mountain. It had been cold enough the night before that even hardy alpine plants were frozen and wilted. When we returned to Agnew Meadows and the motel in Mammoth Lakes, we found that Lindy, Lori, and the boys had made the eight-mile trek back the previous day and had enjoyed their first night back in civilization with showers and the motel's hot tub. Set back once again, this time by a freak summer snowstorm rather than the mountain proper, we were convinced that we had made the right decisions, both in bringing the kids back a day early, and in backing down from conditions we were ill-prepared to deal with ourselves. Temporarily set back, but not defeated ... I will return again to attempt "my" mountain. I suspect that it will be with a different group ... none of the kids is interested in another Sierra "adventure" in the near future, and Lindy had once said she would never try that sort of expedition again (after our previous attempt via Ediza Lake two years ago), then relented ... but never again! A rather disappointed drive back to Reno...one last chance to look longingly at Banner and Ritter from Route 395 between Mammoth and Lee Vining. Another stop at Bodie, at least, for more photography. Then we overnighted in Reno, returning to St. Louis on 30 June. Mt. Ritter continues to taunt me, but I do not give up easily! To quote General Douglas MacArthur: I shall return! Mt. Ritter is the taller of the two peaks, dead-center in the photo, at 13,150'. 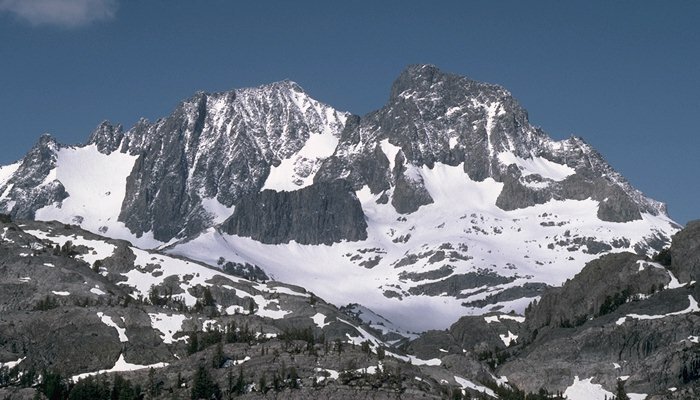 Banner Peak is to the right, just under 12,900'. 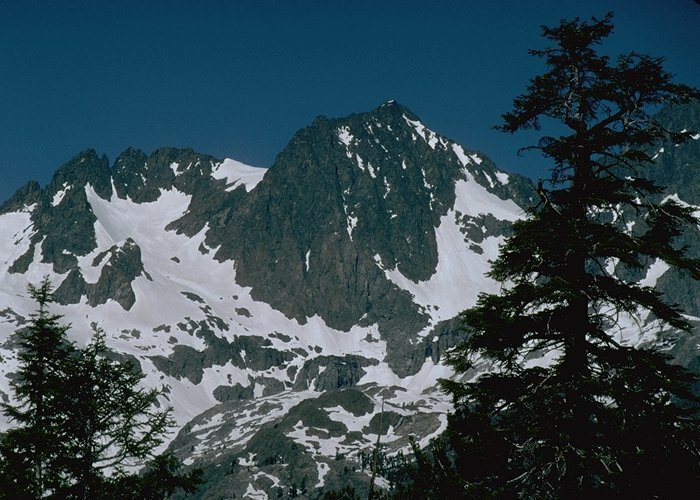 The two classic Class 3 routes go up either the glacier to the saddle between Ritter and Banner, and then up to Ritter's summit ridge, or up the large snow bowl to the left of Mt. Ritter and up one of the chutes to the upper bowl and on to the summit. The Class 2 route up the opposite, western, side of Mt. Ritter was our goal, requiring hiking along the east side of the valley and around past the headwaters of the San Joaquin at Thousand Island Lake, which lies beyond the low intervening ridges and a mile or so to the right of Banner Peak in this view. Shadow Lake and the falls along Shadow Creek are visible to the lower left. You can just pick out the Shadow Creek trail to the right of the falls. That's Lori doing her sun dance by the lake, to no avail! 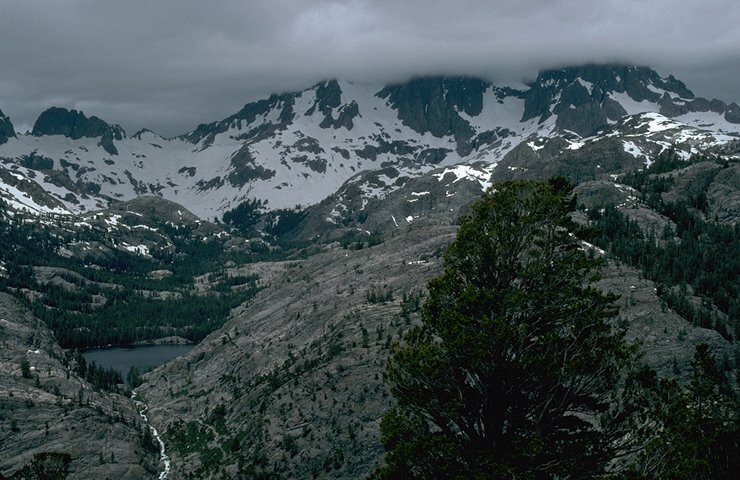 The valley leading to North Glacier Pass is behind the low ridge with scrub pines at the far end of Thousand Island Lake. 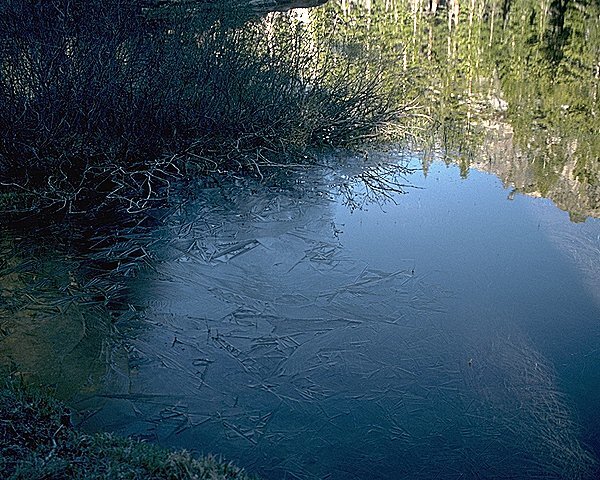 Ice on one of Badger Lakes...yes, it did get cold overnight! Icicles over a rivulet crossing the High Trail...in summer? Compare the fresh snow on this shot with the bare rock of the first photo in the sequence, taken from nearly the same vantage point along the High Trail. With binoculars, it was clear that there had been some small snow slides during the storm.